U.S./U.K. Discography plus Concert Photos, Reviews and Commentary. of this talented and amazing band as "only a soft-rock group" is inaccurate and unfair. outreach as suggested in the fine print of my rambling essay below. include the continuation of the six-part "essay" started on this page plus links to various relevant websites and a list of acknowledgements. Also Larry, Mike and Jimmy in memoriam. BREAD RELEASES in the U.S. and U.K. (updated Sept. 18, 2015). LIST OF BREAD SONGS (updated Sept. 21, 2005): Songs are listed with reference to the original albums. A supplementary list augmented with additional compilations is found here. Solo & Duo Releases, Part 1 – Gates (updated Feb. 13, 2009): Includes David Gates' early rockabilly singles and notes on his collaborations with Billy Dean and Melissa Manchester. Check out footnote "D2" for a photo of a David Gates 78 rpm record! Solo & Duo Releases, Part 2 – Griffin, Botts and Knechtel (updated April 29, 2015): Includes James Griffin's start on the Reprise label in 1962 through his duet with Holly released in April, 2005 and ultimately several recent downloadable releases! Also included is a rare LP pressed for the Armed Forces Radio & TV Services. 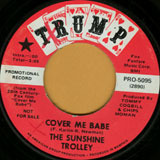 His 1976 duet with Terry Sylvester on "Travellin' Boy" is indicated here. Related Groups (updated Aug. 13, 2012): The Fencemen, The Avalanches, The De-Fenders, The Deuce Coupes, The Darts, The Vanguard Voyagers, The Pleasure Fair (aka The Rainy Day People), The Morning Glories, The Travelers 3 / Na Kama Hele, Joshua Fox, Black Tie, The Remingtons, and GYG (Griffin, Yancey and Guilbeau) whose CD is still available! Bread in Arlington, TX – August 9, 1997. Andrew Butterfield's Review of David Gates in Manchester – March 31, 2003. Charlie Oyama on Mike's Drumming. My Favorite Bread Album for All Time, and it is exactly as described herein. 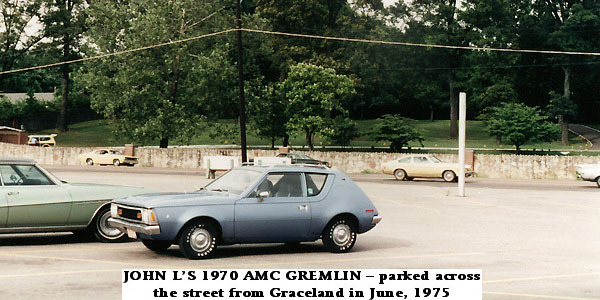 David Crawt's Four-Part James Griffin in Nashville Story – February, 2004. Pete Curry's James Griffin in Memphis Story. My Very First Bread Page on the Web (seen here rendered with the old Mosaic browser). Old radio surveys: KFRC & KHJ. Mike Botts – including discography, photos and his classic road journals. Emmy Award-winning composer and musician Stephen Cohn. Multiple literary award-winner Timothy Hallinan. Rare Bread-related videos can be found on Malcolm's channel. Click here. Bread certainly did rock out in concert: Watch Mike's rendition of "Long Tall Sally" and Jimmy starting the show with "Fancy Dancer." As for the 1996-97 worldwide tour: David, Jimmy and Mike introduced new songs: "Mirror Mirror," "Just Say When" and "The Wait." The GYG video, "Down In The Sunken Road" is here. And you can enter a search on YouTube for "Bread" or any of its members: David Gates, Jimmy (or James) Griffin, Mike Botts, Larry Knechtel and Robb Royer. More links are on Page Three. 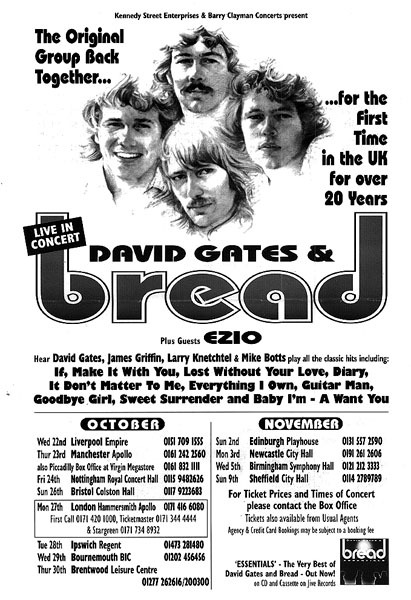 As excellent and tasteful have been the David Gates songs that many of us grew up with and love, notions about Bread that are based only on top-40 radio listening are not entirely valid. You need not just take my word for the above which probably flies in the face of what you may have come to understand from years of radio listening. Indeed, those Bread hits were certainly worthy of scoring high on the record charts (one example of which is here). Now one can sample and/or download any of the 70-plus Bread releases on such sites as Amazon.com. And then you get to hear more than just one lead singer, for one thing. The members of Bread – individually and collectively – have built around themselves a veritable musical kaleidoscope spanning most of rock's history. 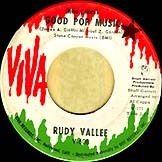 One can dig deep into the vinyl to find solo releases and items done with other bands – including some genuine Buddy Holly-era rockabilly by David Gates with Russell Bridges (aka Leon Russell) on keyboards and Carl Radle on bass. (See The Kansas/ Oklahoma 60's Rock Discography by Tom W. Tourville on which the David Gates discography herein was initially based.) 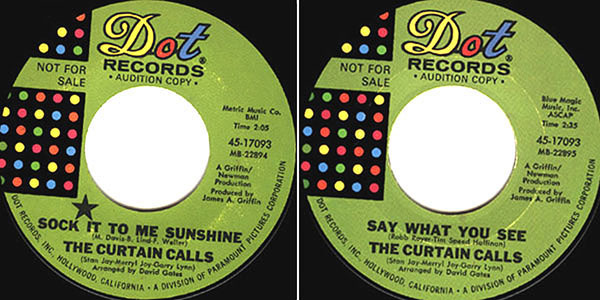 A listing of the substantial contribution to the music industry by David Gates, Jimmy Griffin, Robb Royer, Mike Botts and Larry Knechtel – as vocalists, instrumentalists, writers, arrangers, producers and engineers for so many decades – could fill many web pages and perhaps someday will. It would behoove an oldies reissue label to come out with compilations of solo recordings centered on the individual members of Bread! Certainly such a thing would appeal to more than just the die-hard completists and rock history buffs. As for songwriting, one may find a relatively inexpensive copy of the CD "David Gates, the Early Years," a real collector's item which features a tiny fraction of the songs which he wrote for recording artists of the 1960s. 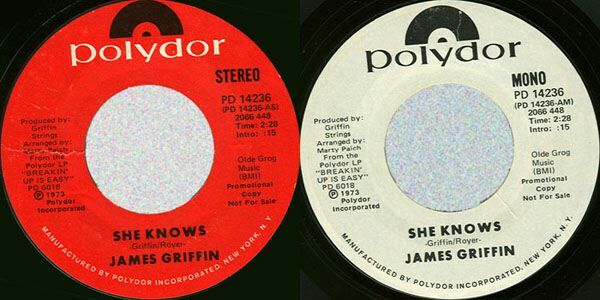 A great example of Griffin and Royer's songwriting collaboration is the 1970 Academy Award-winning "For All We Know" – which was written along with Fred Karlin and made into a no. 1 hit by The Carpenters. The original demo was eventually released on Bread's 1996 "Retrospective" CD. On the related groups page are lists of groups (and their personnel) with which members of Bread have been associated. Very unfortunately I have given short shrift on that page to Larry Knechtel who was a member of a number of groups including the Shindogs and Duane Eddy and the Rebels. For decades he was highly renowned as a session musician (usually on keyboards), having played hundreds of sessions as part of The Wrecking Crew which also included drummer Hal Blaine and bassist Joe Osborn. A couple obscure groups he was a part of were Jamme and Ceyleib People. A multi-page listing of much of his work (with sound samples) starts here. Larry's website has biographical details and a link to a discography. As a session drummer, Mike Botts brightened up a number of album projects, many of which are listed on his discography. A significant omission on that list is the 1977 LP "Blowin' Away" by Joan Baez which contains "Time Rag" – a disco rap song in which Mike played drums with Dean Parks on guitar and Larry Knechtel on organ. The Joan Baez sessions were a lot of fun for Mike as he recounted later. Mike was a member of Na Kama Hele (formerly The Travelers 3) and was also significantly associated with Linda Ronstadt, Andrew Gold, Dan Fogelberg and many others. 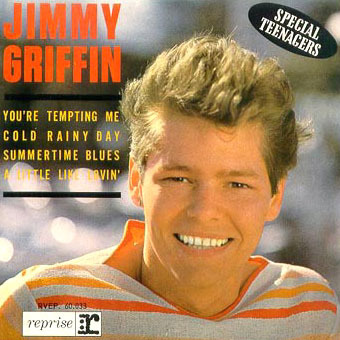 What appears to be Jimmy Griffin's earliest single featuring a song he wrote is shown here. 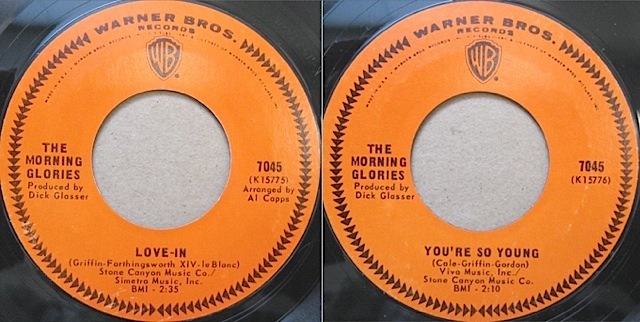 James Griffin appears as lead singer (and co-writer) on "You're So Young" which is credited to The Morning Glories. Also on this 45 is "Love-In" which is an incredible period piece from the Summer of Love (1967). More information is here; see footnote 4A. An early promotional Bread interview 45 is shown here. 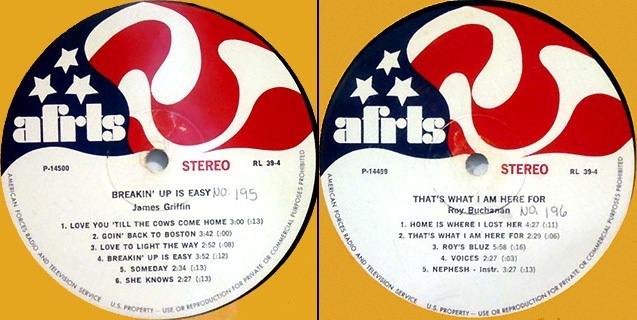 In the footnotes on this page are links to photos of the inner sleeve of the "Breakin' Up Is Easy" LP (footnote J2) and the covers of the rare, import-only "James Griffin" LP (footnote L); these items show some session details and both albums were issued on Polydor. 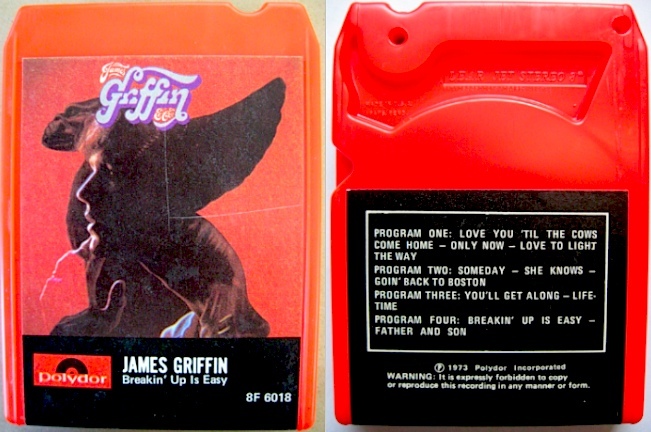 The 8-track issue of "Breakin' Up Is Easy" (front and back) is shown here. In the footnotes on this page are links to photos of the original, LP-only version of the "Black Tie" album (footnote 5) and the covers of the "Joshua Fox" LP with Mike Botts (footnote 2). 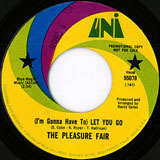 A promotional "mobile" for the "Lost Without Your Love" LP is shown here. 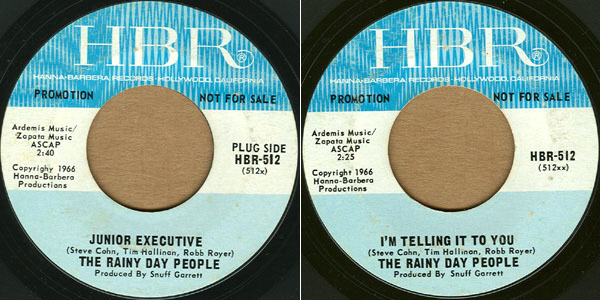 A promotional 45 with a different-colored label on each side is shown here. 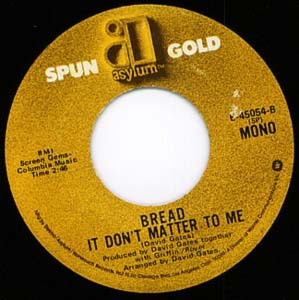 Click here for a Bread single printed with an Asylum label, rather than Elektra. 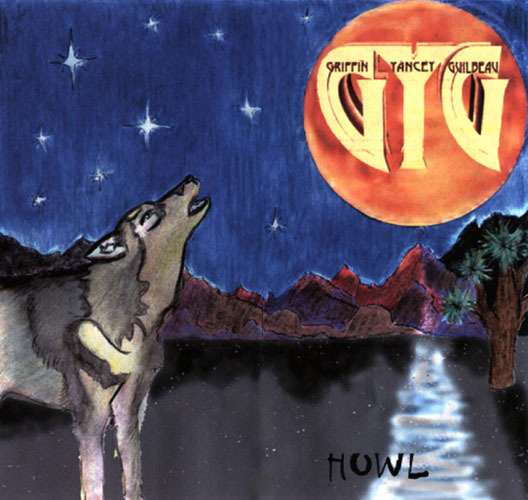 Here is a French EP cover circa 1963, and here is a sketch of a proposed Griffin, Yancey & Guilbeau CD cover. Click on photo for larger image and here for back cover. 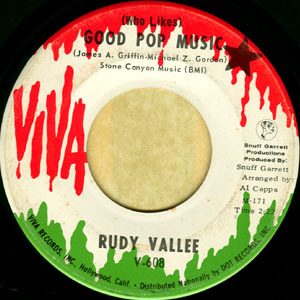 A single containing non-LP songs is shown below. For the LP labels, click here. More information is on this page. A brief history of this amazingly talented group as told by the members themselves begins here. Until the more enlightened biographies of the past decade or so, one would always be reading the same tired old litany about how David Gates, James Griffin and Robb Royer toiled in the studio as "Pleasure Faire" prior to their becoming "Bread." 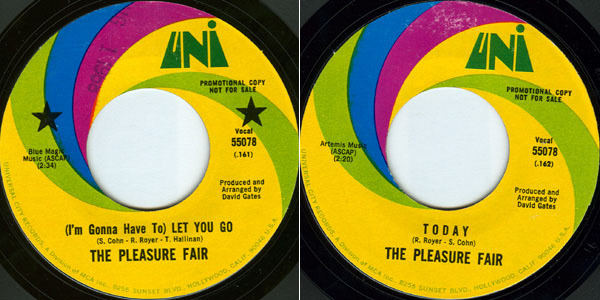 Whether or not "Pleasure Faire" was ever under serious consideration as their group name, there did exist the distinct, pre-Bread, Gates-produced quartet THE PLEASURE FAIR (without that final "E") who released an album and two singles under that name (listed here) in 1967 and '68. The "Pleasure Faire" appellation (with that final "E") still seems to persist among those who embrace the press jive of their youth. (Or it could be a simple speling mistake.) I once asked a PF member about the "problem" and he replied "to E or not to E" and then happily went on to a different topic. 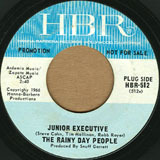 The same group was known by various other names including The Rainy Day People whose 1966 pop masterpiece is shown here. One of the co-writers informs me that the A side ("Junior Executive") was written as a takeoff on the Kinks' "A Well Respected Man" and is not meant to be about any particular individual. 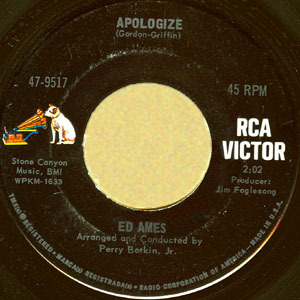 Although Snuff Garrett is shown as producer on this record (one of the very few HBR singles to indicate producer credit), he sent the group to Leon Russell and J. J. Cale who were the actual producers of this single. Michele Cochrane was recognized for her gorgeous singing voice, and she acted in a number of movies. Classically-trained musician and composer Stephen Cohn won an Emmy Award for Outstanding Achievement in Music for his chamber ensemble score for a PBS documentary film, and much of his guitar style was significantly incorporated into Bread's sound. Mystery writer Timothy Hallinan is the author of the Simeon Grist series of detective novels (get the grist/bread connection?) and the more recent and ongoing Poke Rafferty and Junior Bender series. Click here! The unique sound of many recordings during Bread's first few years was due in large part to Robb Royer who was also responsible for a lot of lyrical substance in the Griffin-Royer compositions. In recent decades he has achieved great success as a country music writer as a Google search can reveal. His work as producer, writer and artist defies categorization which is a useless endeavor anyway. The Pleasure Fair made a brief TV appearance on "Ironside" in the episode "Tagged For Murder" which was aired October, 1967. This was Episode 8 in the first "Ironside" season which is now available on DVD. The group is shown listening to a playback of "Turnaway" in a recording studio. A summary of the group's history can be found on Wikipedia where one also can find reasonable biographies of various individuals mentioned on this breadsite. And you can listen to "Morning Glory Days" on YouTube here. David Gates' own recording career dates back to 1957, and the steady succession of his pre-Bread solo singles is shown here. Records showing Gates as producer and/or writer constantly turn up in collections of old vinyl, and a new CD compilation that provides a glimpse of his songwriting career in the 1960s came out in 2013 (see "News" above). A bit of his work as a session musician can be heard on the "Sharon Sheeley: Songwriter" CD. 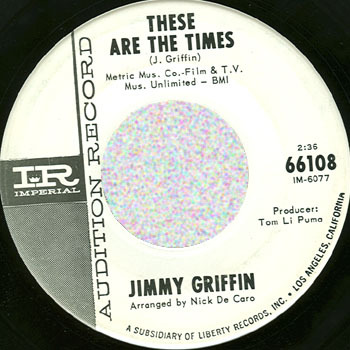 Jimmy Griffin and Robb Royer's writing, performance and production activities (yet to be fully documented anywhere) were every much a precursor to Bread as were those of The Pleasure Fair or David Gates. Check out the list of Griffin's pre-Bread recordings here. Some of the recordings in the "Griffin by Others" category are included in the very incomplete lists on this page. 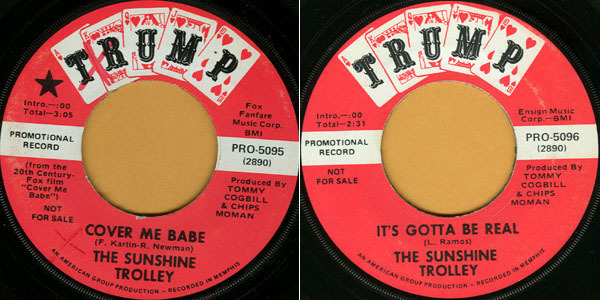 The catchy and impressive "Get The Message" was recorded around 1967-69 by a number of artists including Brian Hyland, Bobby Vee, Sagittarius (Michael Fennelly, lead vocal), Michael J. James, and The Young Men. Among Gordon's comments with The Young Men's version on YouTube: "Jimmy didn't actually write this song but he got credit because he did such an amazing job in the studio when we recorded the demo. He sang all the voices and played all of the instrumental parts and many of the artists copied his arrangement note for note." A product of their renewed collaboration – "Something Else Altogether," sung by Jimmy Griffin himself – was intended for a motion picture retelling of "The Devil and Daniel Webster." After some drastic overhauls which included deletion of the song altogether, the movie made an appearance in the summer of 2007 with the new title "Shortcut to Happiness" and has been released on DVD in selected countries including Australia, Poland and the Czech Republic. Both versions of the film featured the same cast with Alec Baldwin, Jennifer Love Hewitt and Anthony Hopkins in leading roles. A trailer which goes along with the first, deleted version is shown here, and you can hear "Something Else Altogether" in its entirety. With the revision of the film, the inclusion of "Something Else Altogether" probably would have set an inappropriately heavy tone for this fast-paced and compelling movie which I found totally enjoyable (casting, plot, etc.) after finally locating the Czech copy in 2012; the official trailer is shown here. "Something Else Altogether" is part of the 2010 collection of Gordon songs available as a download here. This collection also includes Gordon-Griffin collaborations from the 1960s; see the detailed listing here in our discography which is followed by a second set of downloadable tracks released in 2011! The new Bobby Vee "Rarities" CD set includes two songs: "Save A Love" (a Vee-Griffin duet in blazing stereo from 1966) and "Take Away"; some more information is here. Here is where Bread comes together: An interesting Dot single by THE CURTAIN CALLS came out in 1968 which showed James Griffin as Producer and David Gates as Arranger. 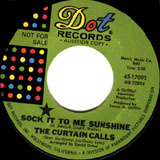 The A-side, "Sock It To Me Sunshine," is sung in falsetto by the three individuals listed on the 45 who performed the song on the TV show "Laugh-In": Stan Jay, Merryl Jay and Garry Lynn. The B-side, "Say What You See" (written by Robb Royer and Tim Hallinan), sounds like an energized Pleasure Fair but the extent of their actual involvement may have been minimal. 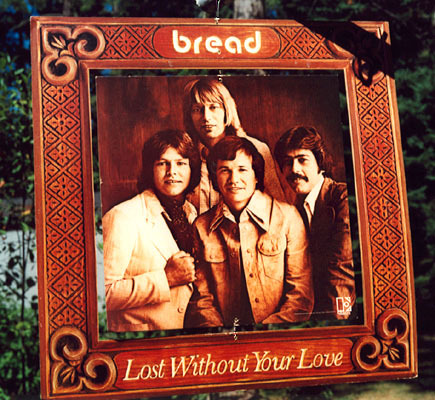 At any rate, production of this single was the point from which Griffin, Royer and Gates combined their talents into the group that made BREAD their name. But why "Bread"? The original inspiration came to Robb Royer when he and Jimmy Griffin encountered a Barbara Ann Bread truck while in heavy traffic. When decision time came to name the group officially and "Bread" was offered, it was pointed out that a lot of musicians put on a show of disdain when it comes to the thought of deriving bread (as in monetary riches) from their art. There being no need to be phony in that regard (and to take any pride in humility such as this), then why not just go with the name? is theatre of the mind. You can sample and/or download it at CD Baby where you will also find the hard copy and the story behind this production. It's good science fiction and would sound great as a radio drama. Bread's first album from 1969 is still a breath of fresh air, a reflection of the many inventive directions rock was taking in the late 60s. Pre-Mike Botts drummers Ron Edgar and Jim Gordon were listed among the supporting artists as was Tim Hallinan. 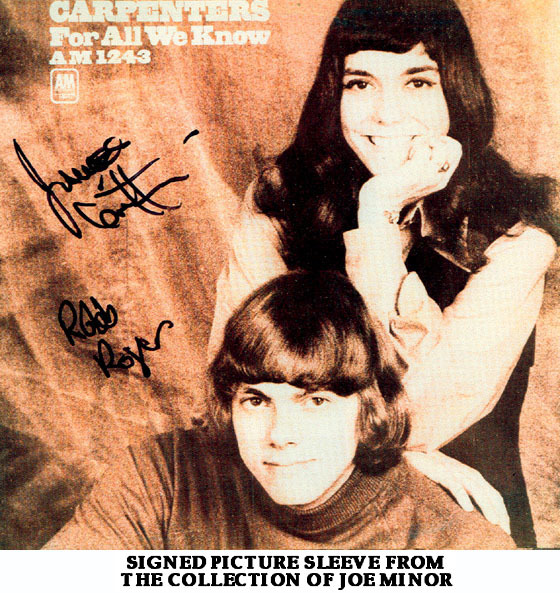 One may occasionally hear or read about "The Plastic Sibling" and the now-released "Cosmo and Robetta" which were Royer and Griffin-related multi-media (and ahead-of-their-time) productions that gave rise to Bread songs eventually released as "Family Doctor" and "Fly Away," respectively. This Bread collectors' site started out as an HTML exercise in table-making and has been on the web in one form or another since May 18, 1997. There is nothing like the freedom of doing one's own HTML routine. Corrections and additions to the history and discography are always welcome. part of a "Breadsite Clean-up Operation" to complete in April. and also if you find any broken links – especially to videos. Bread is the Tiffany of rock groups. Why settle for cheap imitation?